Had a very interesting evening with the senior citizens today. 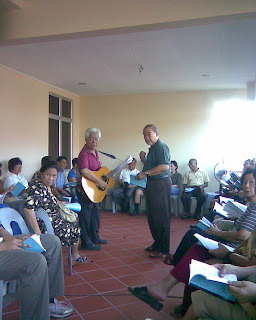 The LCEC members were invited to join their fellowship at Chow Boi and Eileen's house. So KC and I went with jelly and lemang. Such interesting people...they sang their hearts out to all the oldies that I have not sang since MYF days; 'Whispering Hope', 'Red River Valley' etc. They love to sing. After the singing was food time. They love to eat. There was beef, mutton, chicken (rendang and curry), nasi minyak, at least three types of noodles and a variety of desserts. They were not hesitant to eat. To be able to eat and enjoy what we eat is indeed a blessing. Gladys said in twenty years time we will be in their shoes. Yes, if we can live that long. I hope when I do reach that stage; I will be able to sing, eat and laugh heartily like them. Now I am totally uncomfortable with so much mutton and beef swimming in my tummy. Need to go the extra mile on the treadmill tomorrow. May the good Lord bless KC and I with many years of healthy living and we treasure the years that we have with much joy and love. hehe...kena update dgn perubahan semasa.